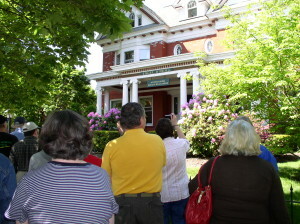 Preservation Erie is the primary advocate for historic and community preservation in Erie. We work collaboratively with neighborhood groups, community revitalization agencies, regional historical societies and museums, as well as organizations such as Preservation Pennsylvania, Partners for Sacred Places, and the Pennsylvania Historical & Museum Commission’s Bureau for Historic Preservation. Public policy issues such as the creation or amendment of local ordinances that will impact historic resources. Creating online petitions and letter writing or email campaigns on critical local and state preservation issues. Publishing newspaper articles on historic preservation as well as letters to the editor and interviews with news media. Advising private developers, community organizations, and individuals on the laws and procedures of historic preservation including designation of historic properties, creation of historic districts, financial resources for preservation projects, and procedures for alterations or demolition of historic properties. Nominating historic properties for local designation and nomination of historic properties to the National Register. Presenting annual awards for accomplishments in historic and community preservation in the Erie region. Advising members and the general public regarding historic property research, selection of contractors or other professional services, and sources of materials for historic property preservation.